As part of centenary anniversary celebrations, more than ten thousand air warriors completed 2.1 Lac Kilometres at 100 Air Force Stations. The Delhi leg of the Half Marathon was held on Sunday at Jawahar Lal Nehru Stadium for the air warriors located in Delhi & NCR. More than 800 air warriors took part in the event. New Delhi: Remembering the first and only “Five Star” rank officer of Indian Air Force Arjan Singh on his 100th Birth Anniversary, a Half Marathon was organised at 100 Air Force Stations across the nation on Sunday. Addressing the participants at Jawahar Lal Nehru stadium, BS Dhanoa, Chief of the Air Staff said, “The Indian Air Force has accomplished a milestone in sporting activity by the simultaneous conduct of half marathon across the country. 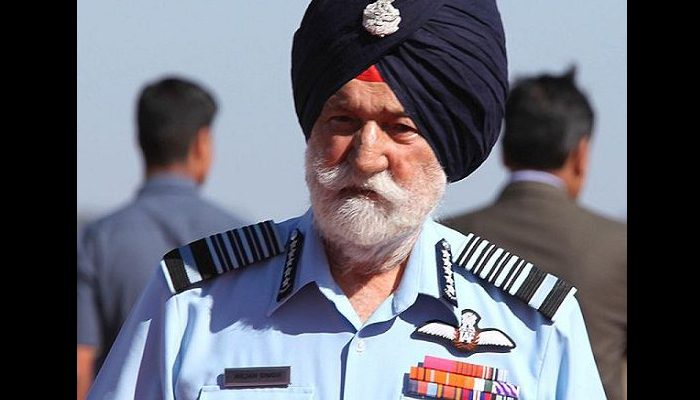 Late Marshal of the Indian Air Force Arjan Singh DFC was an accomplished sportsman. The conduct of this half marathon is a befitting tribute to the legend and an admirable way of expression of our gratitude towards his contribution to the nation. The event highlights our commitment to facilitate sports and to encourage air warriors to set high standards of fitness”. Late Marshal of the Indian Air Force Arjan Singh’s passion for the game of Hockey was unparalleled. The IAF legend had always been an inspiration to air warriors leading from the front not only in the war front but also in the field of sports.